The 23rd IPSA World Congress held in Montréal, Québec (Canada) from July 20 to 24, 2014, drew close to 2,300 participants, not including staff and exhibitors. Participants from 73 countries came to share research and discuss the event’s main theme, Challenges of Contemporary Governance. Over 500 panels and nearly 2,000 papers were presented. Research committee played an active role in organizing some 357 panels. A word of thanks goes out to all the participants, fantastic volunteers and LOC colleagues who helped to make the 2014 World Congress a resounding success! IPSA extends a warm thanks to the participants as well as its partners and sponsors (the Ministère des Relations internationales et de la Francophonie, Concordia University, the American Political Science Association, the Fonds de recherche du Québec-Société et Culture, Turkish Airlines and the Turkish Embassy) for doing their part to make this year’s event a success! Political scientists are often seen not merely as analysts of political matters, but as something akin to engineers sculpting the organisation of power. Globalisation has profoundly altered the work of political scientists, intensifying communication and exchange on issues pertaining to the way in which communities, societies, nations and the world itself are governed. Faced with these challenges, the multi-faceted phenomenon of governance requires a global, comprehensive and multi-tiered approach: from the local association or political party up to the international community, via regional integration or the national regulation of an economic sector. Adopting an approach to political science which is resolutely open to the opportunities offered by interdisciplinary collaborations, we must also support the circulation of theoretical frameworks and empirical approaches which are applicable in the northern and southern hemispheres, to the most developed nations and the panoply of emerging and developing countries. A number of interesting sessions and events were held, not least the Michael Dukakis plenary on international security policy. 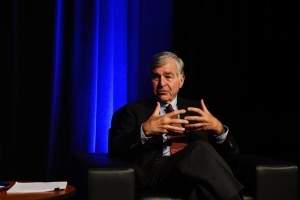 Before a packed plenary room, Governor Dukakis delivered an internationalist perspective on international relations, with a special focus on interstate security. He went on to address the current challenges facing the United States in its historic role as leader of the free world, as well as strained U.S. relations with some Asia/Pacific countries and Russia. Dukakis believes the United States must play a role – albeit a different one – on the international stage. The U.S., he claims, must lead by example by accepting the expertise and competence of international institutions. The key requirements he cited for fostering greater international stability included supporting existing institutions, continuing the process of eliminating nuclear weapons, putting an end to global warfare, and renewing the focus on emerging challenges such as immigration regulation, health care and global warming. Governor Dukakis believes that institutions must be responsible for managing specific issues in order to create a more peaceful and prosperous international environment. Some 2000 participants attended the opening ceremony and the ensuing cocktail reception. Current IPSA president Helen V. Milner, Program Committee Chair Vincent Hoffmann-Martinot, IPSA Secretary-General Guy Lachapelle, and Chief Scientist of Quebec, Rémi Quirion, all welcomed the guests in their opening speeches. Participants were then treated to an exquisite performance by Cirque du Soleil, one of Québec’s best known institutions. The connection between political finance and political corruption was addressed during the session titled Money, Corruption and Political Competition. The discussion on the Shia-Sunni Conflict in the Islamic World raised the issue of what constitutes a truly Islamic state, as well as the differences between secularism and sectarianism. What is it like to be a woman in academics? Cited here was the paradoxical situation whereby female students now outnumber their male counterparts, yet hold comparatively fewer positions as professors and administrators. The ambiguity in the Constitution on the status of courts has given rise to interpretation, especially concerning the nomination process. The relationship between diversity and trust toward immigrants in a given population was discussed in the session titled Accommodating Immigrants: Examining Local and National Governance Responses in the Era of Global Immigration. Special Session – Is there a future for Belgium after 2014? On Belgium’s National Day, a panel composed of Ruth Dassonneville, Kris Deschouwer, Pierre Verjans, Emilie Van Haute and Regis Dandoy spoke about the future of Belgium and the difficulties stemming from its lack of government. Belgium was built on dissension, they argued, reiterating the need for all groups to be represented in government. They also called into question the federal model, suggesting it may not be the best way to reconcile all parties, and argued that a volatile electorate can be a positive force in that it is an indicator of a healthy democracy. In this special tribute session, José Ramon Montero, Dirk Berg-Schlosser, Houchang E. Chebabi, Leonardo Morlino, Francisco Llera and Yossi Shain looked back on the life and legacy of Juan Linz, with a focus on his leap into empirical analysis. They remembered his ability to differentiate between types of regimes, as well as his expertise on Southern Europe. Former students and colleagues spoke fondly about their experience with Juan Linz, while some evoked the difficulties faced by women studying politics. At the end of the day, participants and attendees were invited to a special concert presented by GRAMMY® Winning pianist Angelin Chang, who is also chair of RC18 on Asian Pacific Studies. Given before a packed house, the recital featured works by Bach, Chopin, Shubert and Debussy. Guests were awed by her talent and impressed by her generosity. On Tuesday morning, Prof. Aiji Tanaka was unanimously elected new President of IPSA, succeeding Prof. Helen V. Milner. Prof. Aiji Tanaka is Senior Executive Director for Academic Affairs at Waseda University (Tokyo). His expertise lies mainly in voting behaviour and public opinion as well as Japanese politics. IPSA is proud to welcome Prof. Tanaka as its newly elected president, and we wish him the very best success in his new duties. Flanked by representatives from the Indian Political Science Association, Dr. Sunil Kumar, the recipient of this year’s Global South Award, presented >a lecture on electoral democracy and political demography against the backdrop of recent elections in India. Prof. Kumar, the holder of fellowships from Oxford University and Tel-Aviv University, spoke about the emerging political climate in India, which has been marked by public demands for greater accountability and transparency and more effective governance. Outgoing President Helen V. Milner chaired the plenary titled Globalization and Domestic Political Change. The four participants – Amaney Jamal, Edward Mansfield, Nita Rudra and Lourdes Sola – discussed the changes wrought by globalization in domestic politics (in the Middle East and North Africa, the United States, India and South America) and the impact of increased trade and foreign investment. Prof. Milner explained that while developing countries now account for close to 50% of the global economy, there are still major gaps in terms of poverty and employment. Participants also looked at why some countries are not benefitting from globalization, owing to lack of foreign investment, persistent conflicts and the absence of a manufacturing sector (the Middle East), or the fear that globalization and outsourcing will lead to job losses (the United States). Three questions were raised: Will democracies persist in a globalized world? What type of leadership should we expect, and who should be exercising it? Will global governance bodies impose their own reforms or cease to exist? In the panel titled Emerging Technologies and Civil Society, the rise of new technologies in civil society sparked questions concerning the use of private data, and the control of access to information and “political technology”. Experts questioned the use of shale gas, suggesting that the shale gas lobby now exerts a profound influence on political actors, though local governments have the final say on resource management given that their constituencies are directly affected by such decisions. The session titled Funding Opportunities for Political Scientists focused on Canadian, European and Québec-based research funding programs, drawing academics and doctoral candidates. On Wednesday morning, First Minister of Wales Carwyn Jones discussed the issues surrounding the Scottish referendum on independence and the future of the United Kingdom. Mr. Jones reminded the audience that there is no functional federalism in the UK implying a “balance of powers,” mostly because the states are subject to decisions made in Westminster and are not demographically and geographically alike. The UK, the First Minister cautioned, should not forget about federalism, and he argued that three key principles must be born in mind within the constitutional debate: respect for devoted legislature; parity of structures; and the evolution of executive and legislative competencies. Mr. Jones also mused about the logistical (a new Scottish flag, a name for the rest of the country), institutional and constitutional issues raised by an independent Scotland. Before a full audience, Prof. Pippa Norris, this year’s recipient of the Karl Deutsch Award, presented a lecture titled When do elections fail and why does this matter? Through her research program (The Electoral Integrity Project), Pippa Norris explores the reasons why some elections are deemed failures (Thailand, Ukraine, Afghanistan), advancing various criteria for identifying failed or successful elections, including legitimacy and electoral integrity (political legitimacy / electoral participation, peaceful demonstration, violent protest, international norms). IPSA 2.0 is on its way! In collaboration with the IPSA Portal, managed by Mauro Calise at the University of Naples – Federica II, massive open online courses (MOOCs) were launched on Wednesday, thus following in the footsteps of such major institutions as Princeton and the London School of Economics. The main purpose of IPSA MOOCs is to offer courses geared to Global South students and professors in French, English and possibly Spanish, and to teach basic concepts of political science. Werner Patzelt, Giliberto Capano, Helen Milner and Guy Lachapelle discussed the future of online courses, and where IPSA should stand on this specific matter. Est-ce que l’humour peut être politique? C’est la question à laquelle Christian Vanasse, Michel Garneau (Garnotte), Fred Dubé et Nabila ben Youssef ont tenté de répondre lors de cette session animée par Emmanuel Choquette. Tous ont répondu que l’humour est toujours politique, et que même discuter des rapports hommes-femmes, sous-entendent parfois des concepts patriarcaux. Ils ont estimé que leur rôle en tant qu’humoristes était de dénoncer, et parfois d’éduquer les gens sur des enjeux politiques auxquels ils ne se seraient pas intéressés auparavant. Christian Vanasse a d’ailleurs mentionné qu’il faisait de l’humour pour les militants, et que grâce è l’humour politique, il se sentait un peu moins colérique et plus « humain ». Ils ont toutefois souligné que l’humour politique est une responsabilité à double-tranchant, nécessitant de la nuance, de la recherche et du dosage. Michel Garneau a souligné qu’une distance physique et temporelle est parfois nécessaire avant de pouvoir rire d’un événement ou d’une situation tragique, tout en ajoutant qu’en humour, il ne faut pas avoir de tabou. La session suscita un intérêt important de la communauté médiatique, et fût organisée en collaboration avec l’École nationale de l’humour. Eileen Jerrett presented her documentary, Blueberry Soup, which concerns the emergence of the Icelandic “people’s movement” following the financial crisis of 2008, which saw citizens call for greater accountability from their leaders and bankers. This philosophical and artistic documentary argues that democracy “does not need strong leaders, but rather strong people who can think for themselves.” A Q&A session followed with the director, and audience members were invited to share their impressions and comments on the screening. Lors de la dernière journée du congrès, une session spéciale a été dédiée à l’héritage de Jean Laponce et à l’apport de ses travaux sur la science politique internationale. Les intervenants présents ont souligné la carrière impressionnante de M. Laponce, ancient président de l’AISP de 1973 à 1976. Ils ont notamment soulevé que c’est de lui dont vient l’idée de mettre sur pied un journal pour l’AISP, et qu’il n’hésitait pas à intégrer d’autres disciplines dans ses recherches, notamment la géopolitique, au travers de ses champs d’expertise (partis politiques et référendums, éudes des politiques linguistiques etc.) Tel qu’ajouté par John E. Trent, “nothing was sacred for Jean Laponce”, et avec plus de 16 ouvrages et 140 articles, l’implication de Jean Laponce dans l’AISP et dans le domaine de la science politique en général en fait un acteur majeur dont la carrière se devait d’être célébrée. “Why do we study political science if we disdain politicians?” Such was the question tackled during a special session aimed at discussing the state of political science. Three topical issues were raised: 1) Its actual strength; 2) its relevance to society and politics; and 3) the impact of current politics on the discipline. Participants noted that political science was largely American-centric, as opposed to a more European focus. Each participant brought a regional perspective to bear on representations of political science, be it Russian, Australian or South African. Among the issues raised was the split between quantitative political science (USA) and qualitative political science (Australia, for example), with participants noting that efforts must be made to de-Americanize political science in order to make it relevant to the rest of the world. They also suggested that specialization should not lead to hermetic boundaries, and that in order for political science to remain relevant, intellectual snobbism must be avoided at all costs. On Friday morning, the IPSA Council voted for the composition of the 23rd IPSA Executive Committee. After a very close vote, the following 16 persons were elected: Leonardo Avritzer (Brazil), Roman Baecker (Poland), Daniel Buquet (Uruguay), Linda Cardinal (Canada), Terrell Carver (UK), Jørgen Elklit (Denmark), Carlo Guarnieri (Italy), Rieko Kage (Japan), Marianne Kneuer (Germany), Dirk Kotzé (South Africa), Hatem M'Rad (Tunisia), Chan Wook Park (South Korea), Romain Pasquier (France), Dianne Pinderhughes(USA), Fusun Turkmen (Turkey) and Fernando Vallespin (Spain). IPSA brought the curtain down on the 23rd Congress of Political Science with a series of speeches given by outgoing President Helen V. Milner, newly elected President Aija Tanaka, Secretary General Guy Lachapelle and Program Committee Chair Vincent Hoffmann-Martinot. Theresa Sasinska-Klas, Chair of the Committee on Prizes and Awards (COPA), recognized the prizes that were awarded during this year’s edition (Global South, Juan Linz, Wilma Rule, Stein Rokkan, Karl Deutsch). The Turkish ambassador also presented a speech inviting fellow participants to the next edition, which will be held in Istanbul in 2016. Former Montréal LOC Chair Stéphane Paquin presented Fusun Turkmen, Chair of the Local Organizing Committee in Istanbul, with the official IPSA flag, thus bringing the 23rd World Congress of Political Science to a close.